A Key Lime Pie starts with a sweet and grainy graham cracker crust, that is filled with a creamy smooth lime flavored filling, and topped with lots of whipped cream. 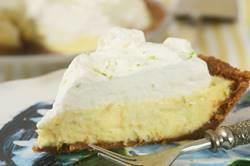 As its name implies, Key Lime Pie was first made in the Florida Keys, which is also where Key limes are grown. John Mariani in 'The Dictionary of American Food and Drink' tells us that the recipe for Key Lime Pie came after the 1856 invention of sweetened condensed milk. Although the first Key Lime Pies were made with a pastry crust, many recipes, including this one, use a graham cracker crust. It is, by far, the simplest of all the pie crusts. Just graham cracker crumbs, a little sugar, and melted butter are needed. If you have trouble getting the right consistency of crumbs to butter, there is a test. Once you have mixed the ingredients together, squeeze a little in your fist; if the mixture holds together, you have the perfect crust. Once the crust is made it is simply pressed into a pie pan and baked until set. Instead of baking the crust, you can also just place the graham cracker crust in the refrigerator until chilled. Next, the filling. A Key Lime Pie is very similar to a Lemon Meringue Pie, only instead of using lemons it is made with Key limes. Key limes are instantly recognizable as they are so much smaller than a regular Persian lime. In fact, it takes about 20-25 Key limes to get 1/2 cup (120 ml) of lime juice whereas you need only 3-4 Persian limes to get the same amount of juice. Key limes are a small, round, hard, yellow and green colored, very acidic fruit that grows in Florida. If you cannot find Key limes in your area, don't fret, as regular Persian limes also make an excellent pie. An interesting side note; although the filling is made with green limes, the color of the baked filling is actually yellow. The only 'green' you will find is from the flecks of lime zest. Along with the limes, the filling contains sweetened condensed milk which is made from whole milk and sugar that are heated until most of the water has evaporated. It is a thick, sticky and very sweet mixture that makes a wonderful Key lime filling. Because the filling also contains egg yolks, we do need to bake the pie until the filling is set. Once baked and cooled it is topped with softly whipped cream. Key Lime Pies can have either a meringue or a whipped cream topping. I prefer whipped cream which is made from the cream (fat) that rises to the top of whole milk. It has a smooth, satiny texture and is labeled according to its butterfat content (heavy to light). The best cream to use for this pie is "Heavy" Cream or Heavy "Whipping" Cream (double cream) which means it has a 36 - 40% butterfat that will double in volume when whipped and hold its form. Because of its superior flavor, I recommend using an organic brand of heavy whipping cream. Key Lime Pie: Preheat the oven to 350 degrees F (177 degrees C) and place the oven rack in the center of the oven. Butter or lightly spray with a non stick vegetable spray, a 9 inch (23 cm) pie or tart pan. Pour the filling over the crust and bake for about 10 - 15 minutes, or until the filling is set. Remove from oven and place on a wire rack to cool. Once it has completely cooled, cover and refrigerate for several hours or overnight. Once the filling has chilled, in the bowl of your electric mixer, with the whisk attachment (or with a hand mixer), beat the whipping cream and sugar until stiff peaks form. Either pipe (I used a Wilton 1M star tip) or place mounds of whipping cream on top of the filling. Can be stored in the refrigerator for a few days. Makes 1 - 9 inch (23 cm) pie or tart. Grigson, Jane. 'Jane Grigson's Fruit Book'. Penguin Books London. London: 1982. Stewart, Martha. 'Martha Stewart's Baking Book'. Clarkson Potter/Publishers. New York: 2005. Walter, Carole. 'Great Pies & Tarts'. Clarkson Potter/Publishers. New York: 1998.